The USS Cyclops a US Navy Collier was dropped on May 7, 1910, and became the second ship of the Proteus class. It served to supply the at that time mainly coal-fired warships, as well as the supply of US outposts (eg Pearl Harbor). 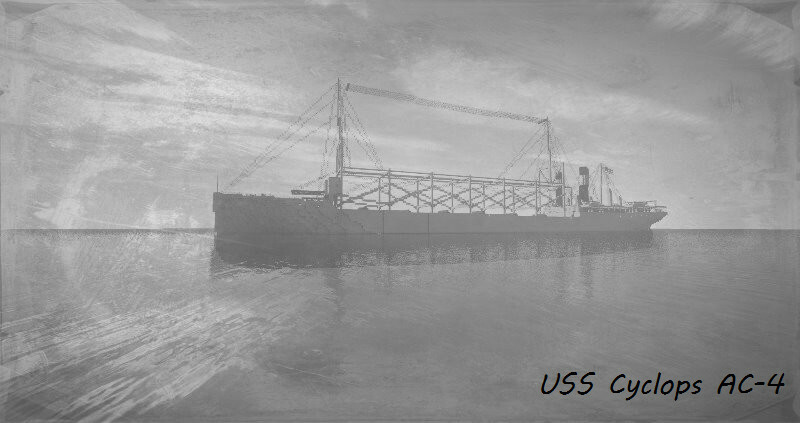 With a length of 165m and a width of almost 20m and a displacement of almost 19,500t (fully loaded), she was one of the larger ships of the US Navy. It was powered by 2 boilers and 2 3-cylinder steam engines. On her last journey, she transported 11,000 tons of manganese ore needed for weapons production from Brazil to Baltimore. Due to a cylinder damage of the starboard machine she made an unscheduled stop in Barbados. What set her off on March 4, 1918, with destination Baltimore. On March 9, 1918, she is said to have been last seen by tanker Amolco near Virginia. But she never reached Baltimore. Since the missing of ship and the 306 crew members and passengers every trace. There are dozens of theories that could have happened. German submarines or the Bermuda Triangle are just two of them. In any case, have fun with the ship.